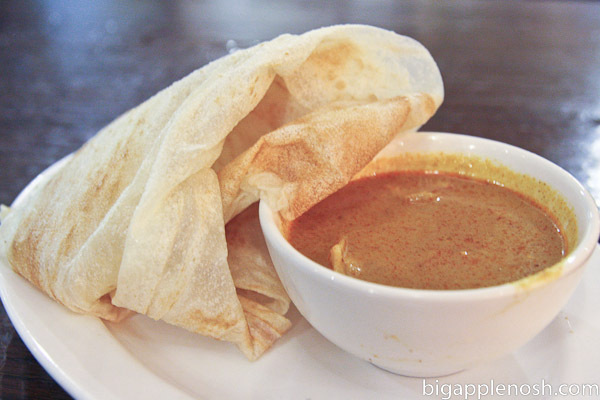 I’ve written about roti canai before (here and here, for example), and the light, fluffy bread with accompanying chicken curry sauce gets me every time. Different restaurants have different roti styles, but I favor Nyonya’s – light, flaky and just a tad chewy. A mix between a crepe and a puff pastry, you’ll find yourself addicted at first sumptuous bite. Considering that prawn mee was the first dish I had the minute I landed in Singapore the past 2 times I visited (yes, this was with my luggage in tow and everything. No, I did not look great), I was a bit skeptical about how good this NYC version would be. 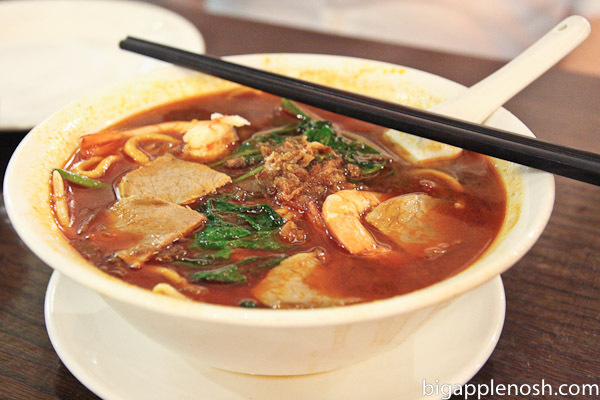 Well color me surprised – while Nyonya’s version had a thicker, brinier broth, it was extremely appealing in its weighty manifestation. I’ll be ordering this again fo’ sho’! To round out our meal, eating buddies and I also ordered the mee siam (first picture), rice noodles stir-fried with tofu, eggs, shrimp & bean sprout in a spicy thai chili sauce and garnished with peanuts. We ordered it “dry,” which means stir-fried – if you want a light gravy, you’d order the “wet” mee siam. These noodles were spicy sweet with a well-proportioned ratio of tofu, shrimp and carbs. Yum. Belacan (pronounced “baLAchan”) is a shrimp paste and chili pepper sauce that is briny, pungent and gives the veggies the perfect kick. 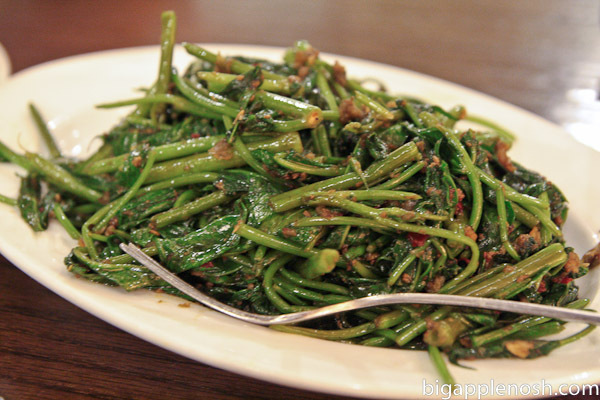 Kang kung, or Chinese water spinach is a green veg (obvi) with a hollow stem and tender leaves. On the occasions where I *must* eat veggies, kang kung belacan is a piquant choice. Our bill came out to less than $35 for 3 people, making Nyonya an authentic, delicious and economical dinner option. I’ll definitely be returning here (as I have many times already) for my Singaporean/Malaysian food fix! Authentic, delicious and economical to boot! 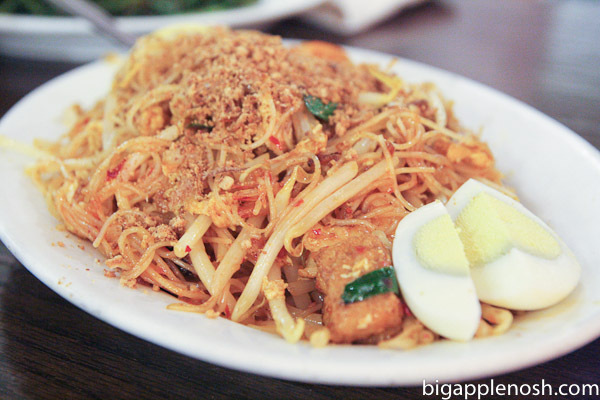 Have you tried Singaporean/Malaysian food before? I don't think I've ever had Malaysian food before so I definitely need to make a stop at this place! Looks fantastic! This post literally has me drooling. Looks great! If you have heard about any great Malaysian places in SF let me me know! That is one type of cuisine I haven't stumbled upon here, but all of your posts have me drooling (and craving)! mee siam and kang kung belacan?? Drooling once again and it's barely past 9! Like Layla, I'm drooling. There is a grumbling noise in my stomach that just can't contain itself. must go find noodles to eat. any noodles. now. malaysian cuisine is one of my favorites. I've also heard of Kang Kung being called Ong Choy. That's my fave dish too. Nyonya is definitely one of my favorite restaurants when I lived in Chinatown. I am craving that crispy roti canai now! I think I'll have to make a stop here when I visit next week! The prawn mee looks and sounds delicious, I don't blame you for wanting to try it in Singapore straight off the plane! Chinese water spinach is my FAVORITE! My mom makes it for me every time I go home. I have never had Malaysian food. I know this is really sad and weird. 🙁 I should find a good place here in the Bay! This post made me hungry! I need to make a trip back to Malaysia or Singapore to get my fix! I so miss authentic roti . . .
Oh how I miss Malaysian (or Indonesian which is extremely similar) food. Especially kangkung. I had a dream about it the other night and woke up drooling. I wish we had a restaurant like Nyonya's in Palmerston North! oh my, i love kang kung! you've made my weekend goal to eat some good malaysian food. Seriously…I have to have this food! It looks so insanely good! These dishes look divine! I hope to try some of it out sometime! I Love Sweet Thai Chile Sauce!The Prawn Mee sounds good,the mi siam looks pretty yummy too! And the Roti Canai looks yummy also! Isn't there something similar to Roti in Indian and Arab food?